It’s a packed house leading into the Thanksgiving holiday. The guys discuss Thanksgiving Foods, a woman eating her boyfriend, deer hunting and Uber Stories. What a Monday Night Football game between the LA Rams and the KC Chiefs. If this is the future of the NFL, ratings will be moving up with the scoring. Coach Macvay has quite the memory. Listen to him narrate the final drive. Trump claims that the forest fires are caused by mismanagement (by liberal California) and believes that if we clean up the “floors of the forest” it will take care of the problem. He stated that the president of Finland told him they spend time raking and cleaning over there. The President of Finland doesn’t recall that discussion. PS: Finland has 12″ of rain. Cali has .02″ of rain! Lock Her Up! Lock Her Up! Not Hillary, Ivanka. Actually… Both of them! Ivanka caught using a private e-mail server to conduct government business for most of 2017. How stupid can you get? Steve brings up the rituals that deer hunters go through and makes a great point about how aware a deer really is. 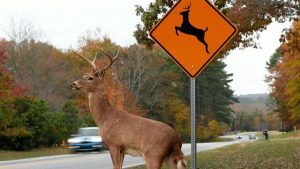 If they notice every movement a hunter makes, why do they stand on the side of the road? Kevin thinks that hunters should probably just dress up like a Ford to attract the deer. Since Steve, Joe and Kevin are now moonlighting as Uber drivers, we created a new segment sharing some Uber Stories. Kevin is first up. See the incident where Steve discusses too much movement in the tree stand. Cleveland Brown’s Coach Wylie can teach everyone a few life lessons. Enjoy. Bob Wylie Drives a Maserati. What else would he drive? Want a chance to win $50? Send an e-mail with your name and phone number to contact@idiotspod.com. We might just call you to join the show and earn a chance to win.